Review of “Dark Matters” at the Yerba Buena Center for the arts. Spring, 2008. Gluck, Robert. 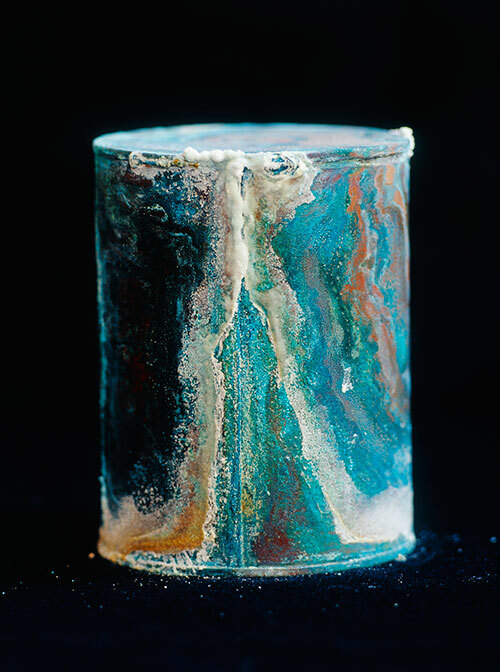 David Maisel’s 2005-07 series Library or Dust shows eroding storage canisters, discovered in a closed Psychiatric hospital which hold the unclaimed ashes of cremated patients. Such strange abandonment renders a sense of displacement, which is supported by the violently gorgeous colors of oxidation that bloom across the cans. Does this beauty mean we should look at these strange funerary urns? Are they memorial sculptures framed by art and given an audience? Or do we intervene by rejecting the idea that they “stand for” anyone’s life?